Arlington, Va. – The Patients’ Access to Responsible Care Alliance (PARCA), a coalition of organizations representing the interests of millions of patients and non-MD/DO health care providers, is calling on Congress to reject new legislation that would limit patient access to needed care. The Truth in Healthcare Marketing Act of 2015, introduced by Rep. Larry Bucshon (R-Ind. ), and David Scott (D-Ga.), would charge the Federal Trade Commission (FTC) with launching a new effort aimed at identifying and documenting specific misleading or deceptive acts by health care providers. As noted in its letter, PARCA agrees that individuals who are not qualified and/or appropriately licensed or certified to provide health care services should not be permitted to serve patients. However, the coalition believes that patients benefit by having accurate information about, and greater access to, a wide range of health care services performed by the professionals educated, trained, and licensed or certified to perform those needed services. PARCA coalition members, who represent a group of 800,000 non-MD providers, believe the proposed legislation will restrict patient freedom to seek care from the provider of their choice, stifle competition in the health care marketplace, and result in increased costs for patients, health care providers and the federal government. The PARCA coalition, led and originally founded by ACA, aims to provide federal policymakers with access to information from all areas of the health care community, in order to assist in the formulation of responsible, well-rounded health care policy. The diverse coalition includes groups such as the American Association of Nurse Practitioners, the American Academy of Audiology, and the American Optometric Association. More information is available on the PARCA website. “Beyond the risks of overuse and addiction, prescription drugs that numb pain may convince a patient that a musculoskeletal condition is less severe than it is, or that it has healed. That misunderstanding can lead to over-exertion and a delay in the healing process or even to permanent injury,” says ACA media spokesperson Robert Hayden, DC, PhD. Arlington, Va. – The American Chiropractic Association (ACA), in recent comments submitted to the National Institute of Neurological Disorders and Stroke (NINDS) Office of Pain Policy on the draft National Pain Strategy, strongly urges the agency to include recommendations encouraging patients and health care providers to first exhaust conservative forms of pain management, when appropriate. The comments submitted by ACA are part of the profession’s on-going efforts to educate the public about the value of exhausting non-invasive, non-pharmaceutical treatments for pain management and health enhancement before moving on to other options. This health care model encourages, when appropriate, the use of more cost-effective and safer approaches over potentially addictive medications, surgery and other invasive procedures for pain management and health enhancement. Conservative management of painful conditions may include chiropractic manipulation combined with exercise and stretching prior to moving on to treatments involving higher risk. The comments received by NINDS from ACA and other groups will be used to create a comprehensive population health level strategy for pain prevention, treatment, management, and research. Arlington, Va. – At the urging of the American Chiropractic Association (ACA), the Centers for Medicare & Medicaid Services (CMS) has clarified a section of the Patient Protection and Affordable Care Act (PPACA) that led some states to improperly limit patient access to chiropractic physicians and other qualified non-MD/DO health care providers. On May 26, CMS withdrew and replaced a Frequently Asked Questions (FAQs) document on Section 2706(a) of the 2010 Patient Protection and Affordable Care Act (PPACA) with one containing a more realistic approach to the issue of provider non-discrimination. The new FAQs establish a more reasonable standard for Section 2706(a) enforcement and are more in line with ACA’s understanding of the issue. Proper implementation of the law had been hampered in part by flawed information distributed in 2013 by the HHS Center for Consumer Information and Insurance Oversight (CCIIO), which led some states to limit patient access to qualified health care providers, including chiropractic physicians, based solely on the providers’ licenses — in direct contradiction to the intent of Congress. “We would suggest that this new language strengthens the point that singling out chiropractic care for special discriminatory treatment is a clear violation of Section 2706(a). The new FAQs reflect ACA’s impact on this issue, as we were instrumental in all points that the new document referenced,” added Dr. Hamm. A key dimension to Section 2706(a) is patient access to covered services from licensed doctors of chiropractic (DCs), and other non-MD/DO providers. ACA works on an ongoing basis with states and other stakeholders to ensure the proper enforcement and aggressive implementation of that section of the health reform law aimed at curbing discriminatory abuses against the chiropractic profession and other health care disciplines. The FAQs were prepared jointly by the U.S. Departments of Labor (DOL), Health and Human Services (HHS), and the Treasury. Like previously issued FAQs, these answer questions from stakeholders to help people understand the PPACA and benefit from it, as intended. Arlington, Va. – During National Chiropractic Health Month (NCHM) in October, the American Chiropractic Association (ACA) will work with thousands of doctors of chiropractic (DCs), chiropractic assistants (CAs) and chiropractic doctoral students nationwide to bring attention to the public health crisis caused by pain, and in particular the overuse of prescription painkillers, with this year’s theme #PainFreeNation. The campaign is part of the profession’s ongoing efforts to educate the public about the value of exhausting conservative forms of care for both acute and chronic pain before resorting to higher risk options, such as opioids. “Opioid medications involve the risk of overuse and addiction. Beyond the risks of overuse and addiction, prescription drugs that numb pain may convince a patient that a musculoskeletal condition is less severe than it is, or that it has healed. This misunderstanding can lead to overexertion and a delay in the healing process or even to permanent injury,” said ACA President Anthony Hamm, DC. President Hamm noted that people in pain should be informed of all management strategies, including non-drug approaches such as chiropractic, to reduce their risk of overuse and addiction. “Each patient is unique, and care plans should be tailored to focus on what is the safest, most effective treatment for the individual. Chiropractic physicians stand ready to work together with medical physicians to help address this epidemic that has caused unnecessary suffering, enormous loss of human potential and massive financial and personal costs,” he added. During NCHM this fall, ACA will offer chiropractic physicians resources to help them share information about their conservative approach and why it is especially significant to today’s health care consumers amidst the opioid epidemic. For updates and more information on #PainFreeNation as October 2015 comes closer, go to www.acatoday.org/NCHM and follow ACA on Twitter at @ACAtoday and on Facebook, LinkedIn and Instagram. 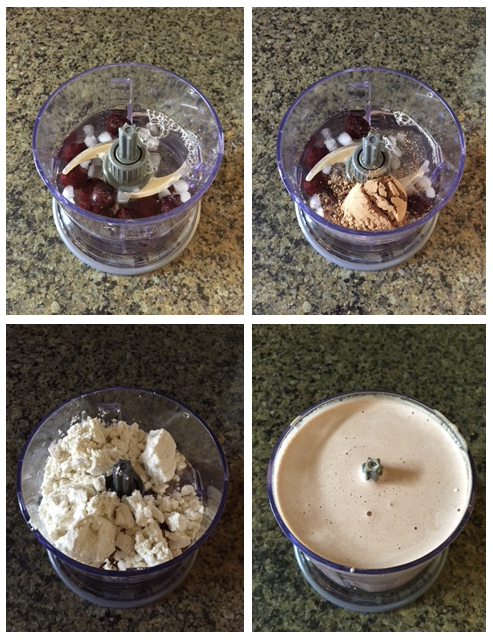 Simply add all of the ingredients into your blender. I use the Ninja Master Prep because it’s fast and easy to clean. I recommend using raw organic cacao powder, not the manufactured cocoa powder stuff made by Hershey’s. Liquid stevia drops work better than powdered stevia, which often leaves a gritty aftertaste. According to this Columbia University study, cocoa flavonoids can reverse age-related memory loss, improve brain function, and even lead to better scores in memory tests. The antioxidants in cocoa flavonoids also have a protective effect on cardiovascular health. Cherries possess anti-cancer properties, promote healthy sleep, reduce inflammation, and can combat belly fat. They can also lower your risk of stroke, and even serve as a natural form of pain relief for arthritis. Goat protein is a terrific alternative for people who are sensitive to lactose in dairy. I realize how foreign this may seem to some readers at first, especially since a lot of people don’t realize how common goat’s milk is outside of America… but let me assure you, this form of protein powder tastes exactly the same as conventional whey protein. The advantage is you won’t have to suffer from the common side effects associated with dairy (i.e., diarrhea, asthma, allergies, bloating and irritability) or soy-based emulsifiers. Suppose you visit a chiropractor who recommends a year long course of treatment. You might be wondering if this is common in the chiropractic profession. It’s reasonable and prudent to ask if this is a necessary and truly beneficial treatment plan. So let’s discuss it. To clarify, it’s not my purpose or place to tell you what you need or don’t need. By all means, listen to your doctor’s recommendations and then do whatever you feel is best for your situation. I’m simply an advocate for making well-informed decisions, especially when it comes to health matters. Now, let’s investigate where the concept of year-long care plans originated. You might be tempted to think it begins in chiropractic school… but it doesn’t. In fact, not once during my chiropractic training can I recall any of my instructors encouraging this protocol. If anything, it was quite the opposite. In a nutshell, chiropractic students learn to assess a patient’s chief complaint, perform diagnostic procedures, determine the most likely cause of the problem, provide short-term treatment, and then re-evaluate the patient to determine if what they did worked. They also learn to spot red flags and identify conditions that need immediate medical referral. The most important part of this process was re-evaluation. Is the patient responding to care as expected? If not, change treatment or refer out. The answer, sadly, is that the business side of chiropractic is learned from “practice management” companies. Self-proclaimed “coaches” impart anecdotal business advice upon impressionable chiropractors. Anyone, proven or unproven, can be a coach. Some of these individuals have only been in practice for a few years themselves, and are up to their eyeballs in debt. Others are veterans who drive Bentleys and own private jets… some have gone to jail. This murky advice comes at a hefty price, costing anywhere from a few hundreds dollars per month to upwards of $60,000 per year. I personally know doctors who have spent hundreds of thousands of dollars throughout their career on coaching. While not all coaching programs teach the same procedures, a pervasive theme amongst many of them involves year-long care plans. But why? What is it about 12-month commitments that makes this concept so ubiquitous within the chiropractic profession? I wish I could tell you that the person who benefited from this the most was you – the patient. Unfortunately, this approach caters more to the doctor. See, running a chiropractic office isn’t much different than operating any other kind of business. Rent, utilities, insurance, inventory, employees, etc… all need to be paid before profits are generated. There’s a certain dollar amount that needs to be collected each month just to keep the doors open. Having a predictable or pre-determined patient load makes the chiropractic business owner’s job considerably easier. If a chiropractor has to see 200 patient visits per month to break even, the first way to insure that happens is to get new patients to “sign up” or commit to long-term care plans. From there, it helps to devise a cookie-cutter schedule of treatments for all new patients to follow. Why see patients “as needed” when you can instruct them to come in one, two, or even three times per week… for a year! Cha-ching! Instead of growing the business by creating value for the patient, doctors are trained by practice management companies to place a value on the patient. This business model infected the profession more than 35 years ago. It has become so common that new graduates who have never even spoken to a practice management company often think that scheduling patients “three times per week for 12 weeks” is the standard of care (monkey see, monkey do). To this day, I cannot logically wrap my head around such an intense frequency of care. Maybe that’s just me… I’m sure there are thousands of patients out there who’ve happily paid for and completed year long care plans with much success. I’m not disparaging their decision, their doctor, or their results. But I’ll leave you with this… If you find yourself having to decide whether or not you should sign on the dotted line, I want you to know that patients can get outstanding results without ever committing to 12-months of care. You may be wondering if that is not unusual in the chiropractic field. It is wise and practical to inquire when this is a genuinely valuable and necessary treatment strategy. Therefore let us discuss it. To clarify, it is not my goal or place to let you know what you do not want or want. By all means, pay attention to your own physician’s recommendations and do anything you believe is best for the scenario. I am just an advocate for making well informed choices, particularly in regards to health issues. Now, let us investigate where the idea of yearlong care strategies originated. You may be enticed to believe it starts in chiropractic school… but it does not. Actually, not once during my chiropractic training am I able to remember this protocol supporting. It was quite the reverse if anything. The bottom line is, chiropractic students learn how to assess a patient’s primary complaint, perform diagnostic procedures, discover the most likely reason for the issue, supply short term treatment, after which reevaluate the individual to find out if what they did worked. Identify conditions that require immediate medical referral and in addition they learn how to see red flags. The main element of the procedure was reevaluation. Is as expected, the patient reacting to care? Otherwise, alter attribute out or treatment. Self-proclaimed “trainers” impart anecdotic company guidance upon impressionable chiropractors. Anyone, unproven or proven, could be a trainer. I understand physicians that have spent thousands of dollars on training throughout their livelihood. While not absolutely all training programs educate a pervading topic, the exact same processes amongst a number of them calls for yearlong care strategies. But why? What’s it about 12-month obligations that makes this theory so omnipresent inside the chiropractic profession? Regrettably, this strategy caters more to a doctor. See, running at a chiropractic office is not substantially different than managing any other type of company. Rent, utilities, insurance, stock, employees, etc… Before gains are produced, all must be paid. There is a specific dollar amount that must be gathered each month simply to keep the doors open. Having a foreseeable or predetermined patient load makes the chiropractic company owner’s job significantly simpler. From that point, it is helpful to formulate a cookie cutter agenda of treatments for many patients that are new to follow along with. Chaching! Instead of growing the company by creating value for the patient, practice direction firms train physicians to put a value on the individual. The field was infected by this business model more than 35 years past. To this very day, I cannot rationally wrap my head around this extreme frequency of care. Perhaps that is only me… I am certain there are a large number of patients out there who’ve finished and happily paid for care strategies that are long with much success. I am not disparaging their results, their physician, or their determination. In the event you uncover yourself having to choose if you need to sign on the dotted line, I’d like one to be aware of that patients could possibly get great results without giving to 12-months of care.